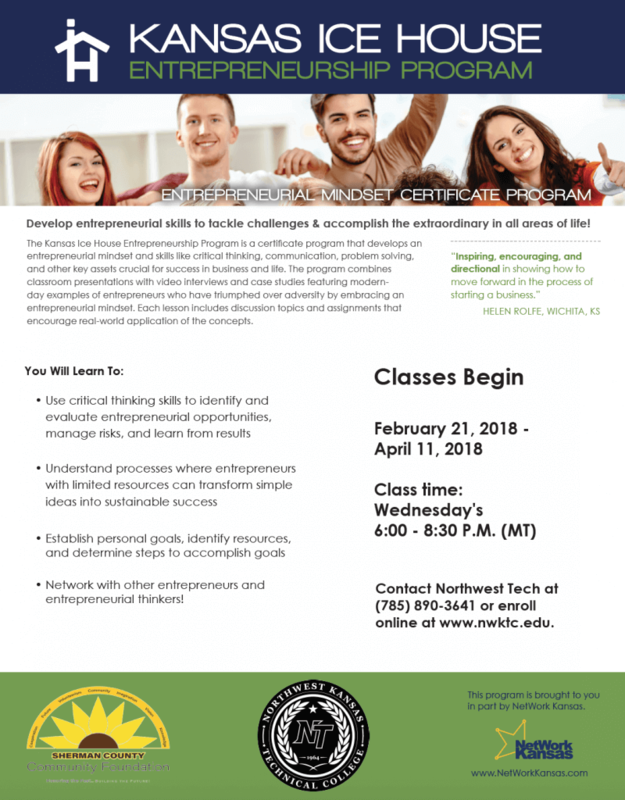 Goodland, KS –Northwest Kansas Technical College in association with the Network Kansas E-Community Partnership, announces the Ice House Entrepreneurship Program will be offered at Northwest Tech this February 21, 2018. Sessions will be held at the Murray Center on Wednesday’s from 6:00 – 8:30 PM (MT). The goal of the course is to teach participants to develop an entrepreneurial mindset. The value of the class is $450. However with the assistance of a grant from the Sherman County Community Foundation and funding from Network Kansas, the first 20 students registered for the class will be allowed to attend tuition free. Taught by Suzanne McClure & James Foster, certified Ice House facilitator, this interactive 8-week program provides practical entrepreneurial lessons through first-hand experiences of successful, real-life entrepreneurs. Based on the book, Who Owns the Ice House, this curriculum consists of video interviews and case studies along with individual assignments, assessments, and discussion topics. This popular course is offered only a handful of times per year across the state and Northwest Tech is bringing this course to the community for the 1st time. For more information contact Suzanne McClure at 785-890-3743 or email suzanne.mcclure@cityofgoodland.org.